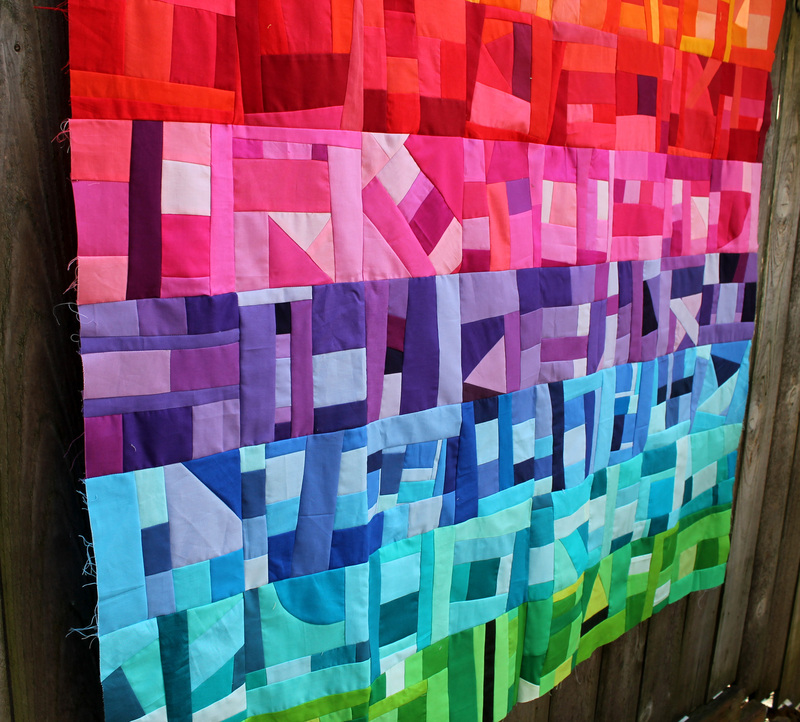 This week I finished up my Rainbow Improv quilt just in time to ship it to Sisters for their quilt show next month….there is nothing like an impending deadline to get you working hard! 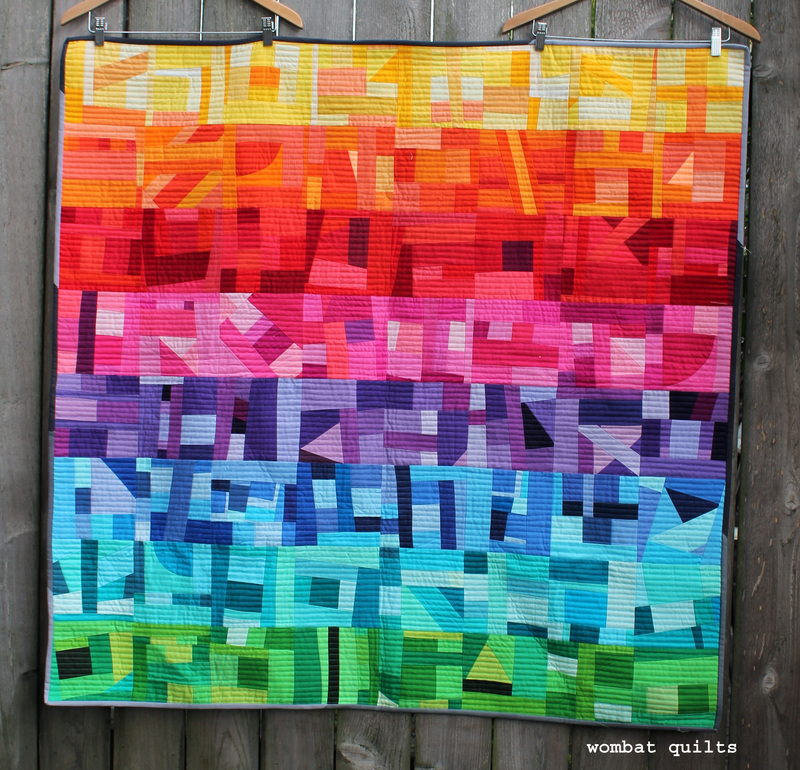 I just used a rainbow of solid fabric scraps and played with colour. 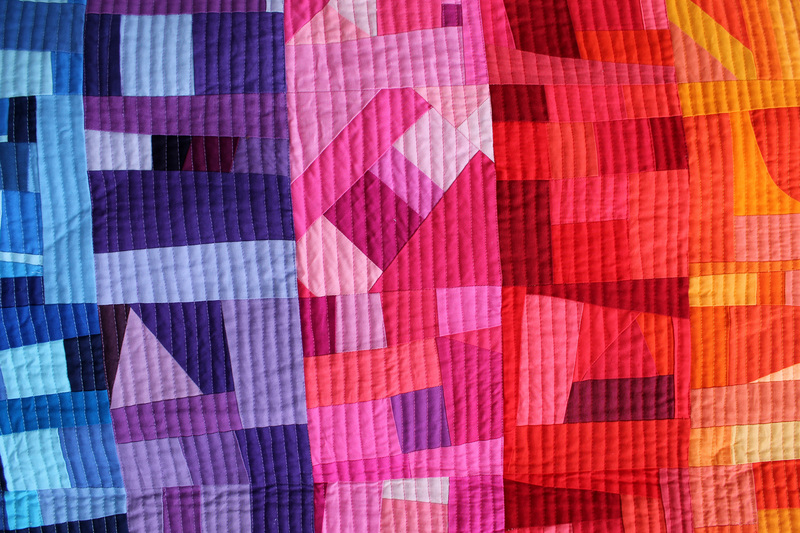 I must admit I did not know what the end product would look like, I just enjoyed the process of making the blocks. 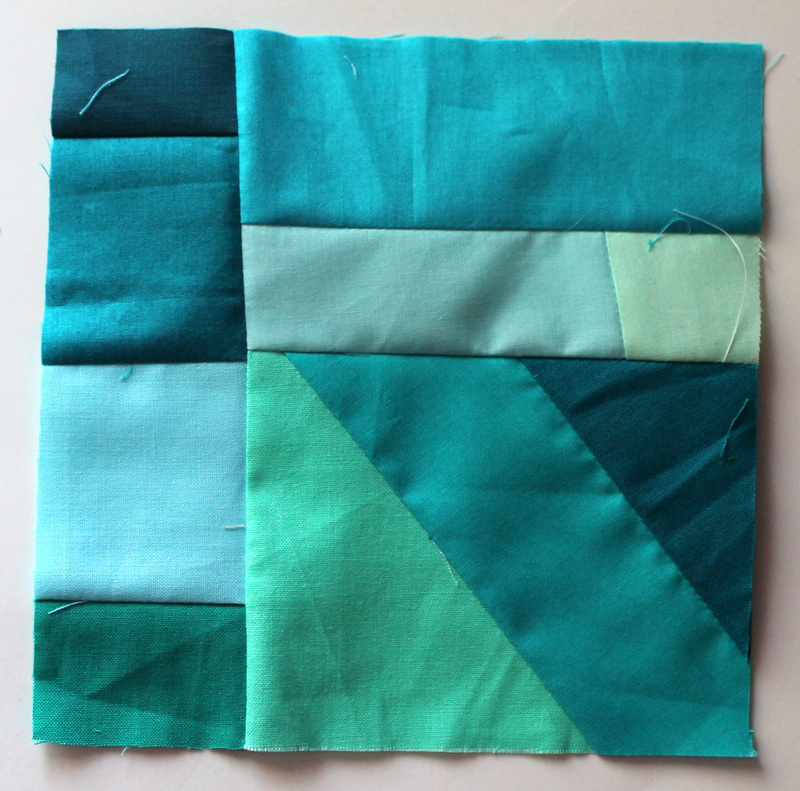 Because this quilt was going to Sister’s I wanted to do something modern for the quilting, but I did not want to distract from the blocks too much. 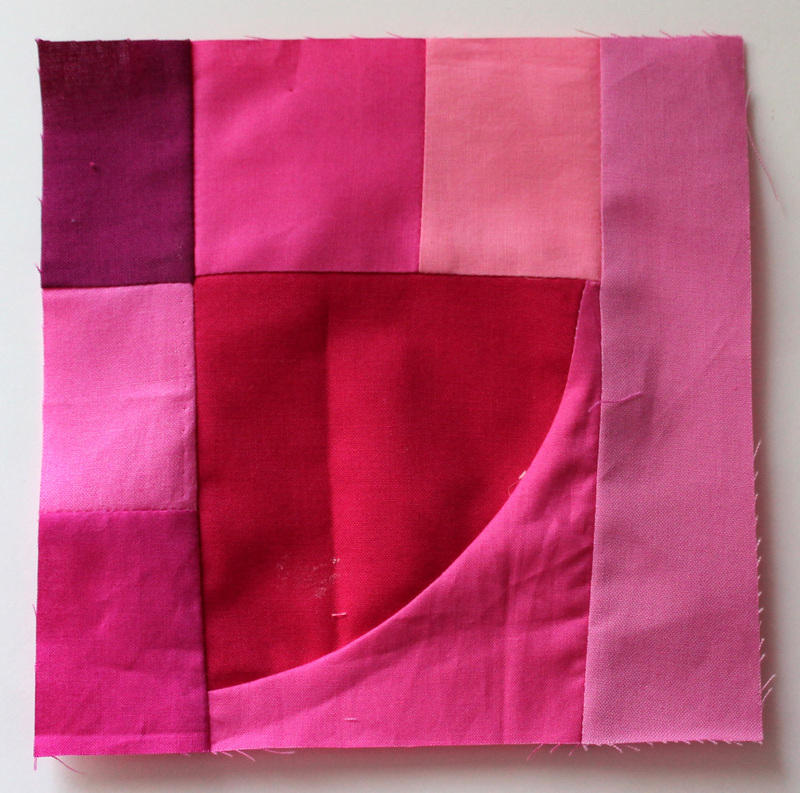 In the end I went with my beloved straight line stitches but used a rainbow selection of thread for the quilting. 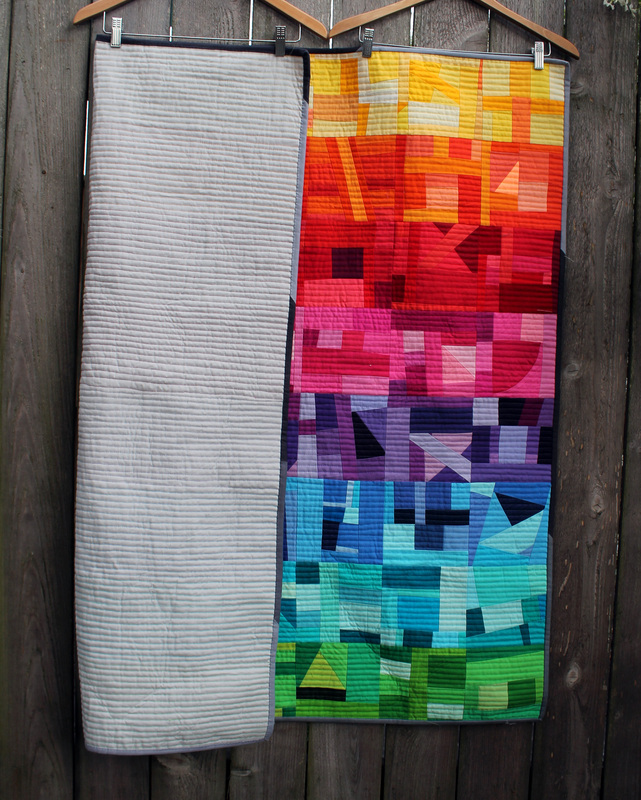 Each row of blocks got their own colour, which was so much fun to do. 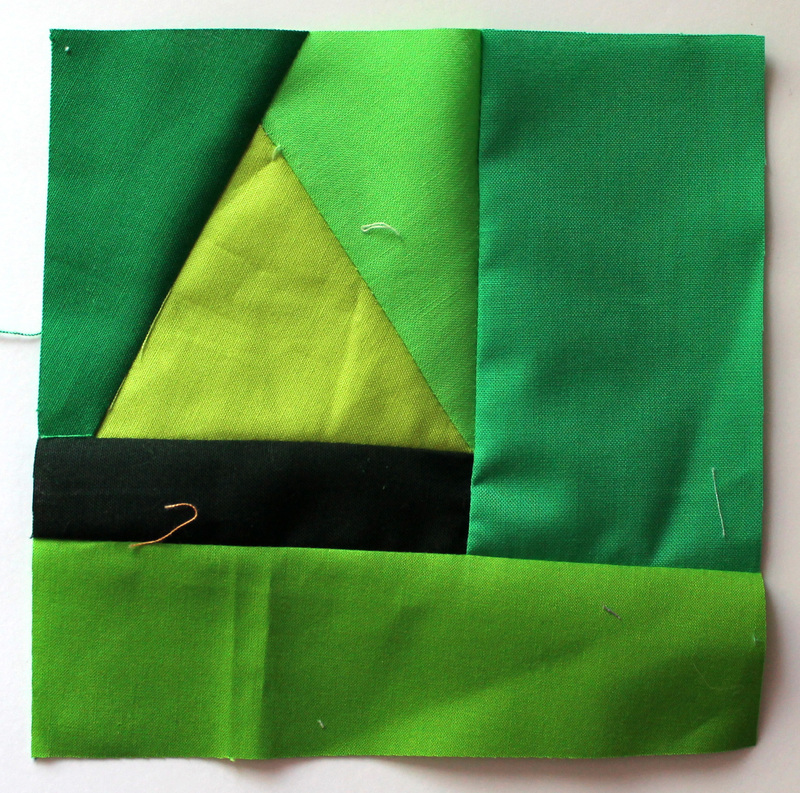 I just used my walking foot as my line guide…I did contemplate marking up the quilt top but this was so much easier and worked out perfectly… I got 16 lines of stitches per row and only went a little off course, one or two times. 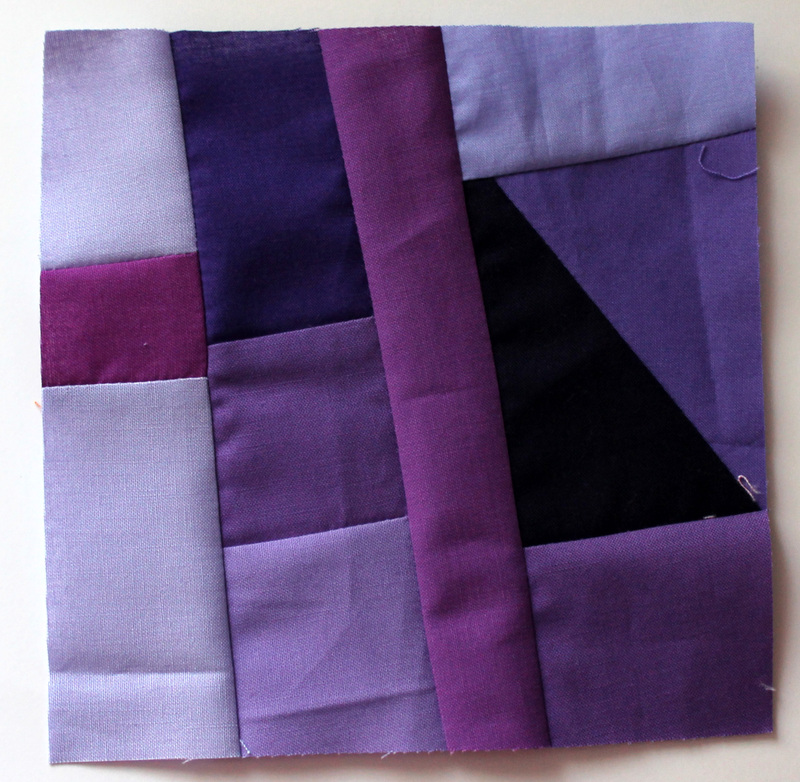 For the back of the quilt I went with a patchwork of solid Kona greys (Ash, Charcoal and Medium Grey), which was perfect for highlighting the change in the thread colour. 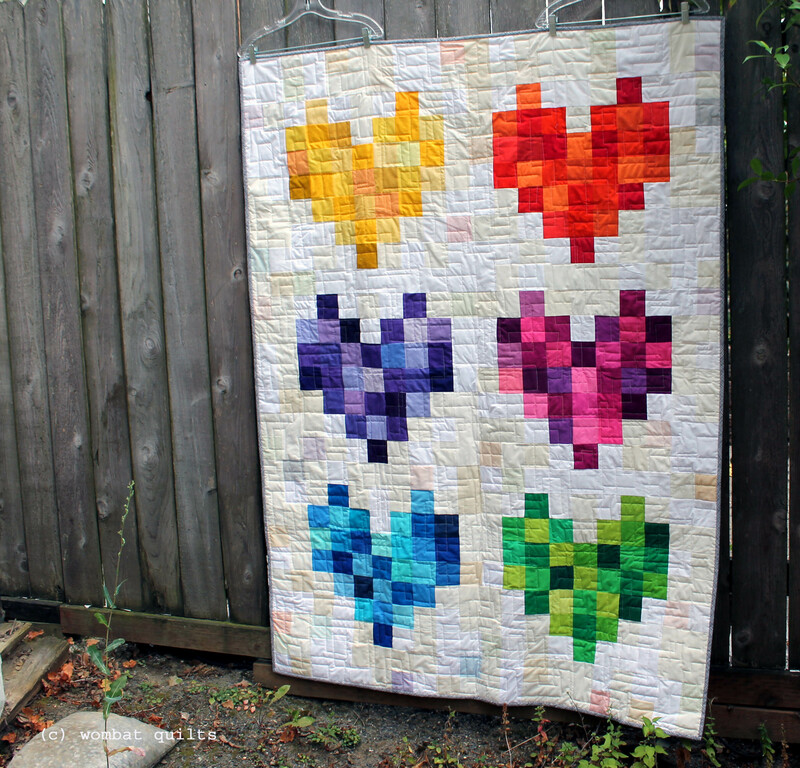 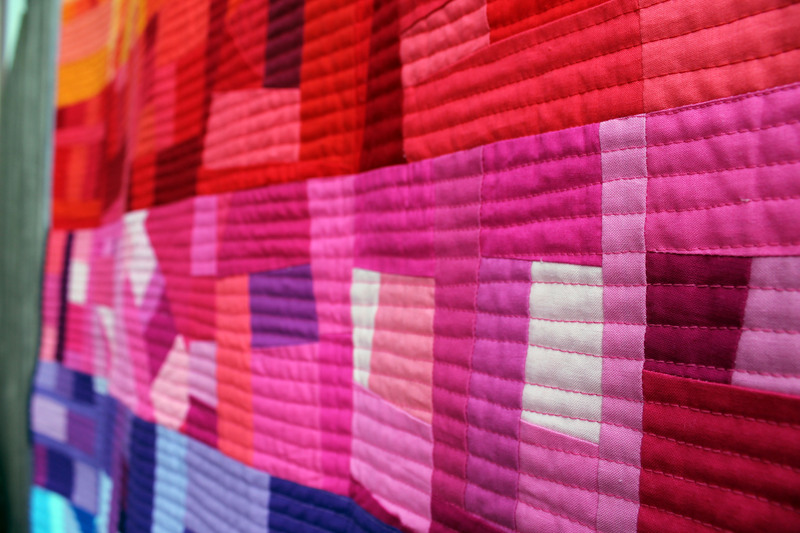 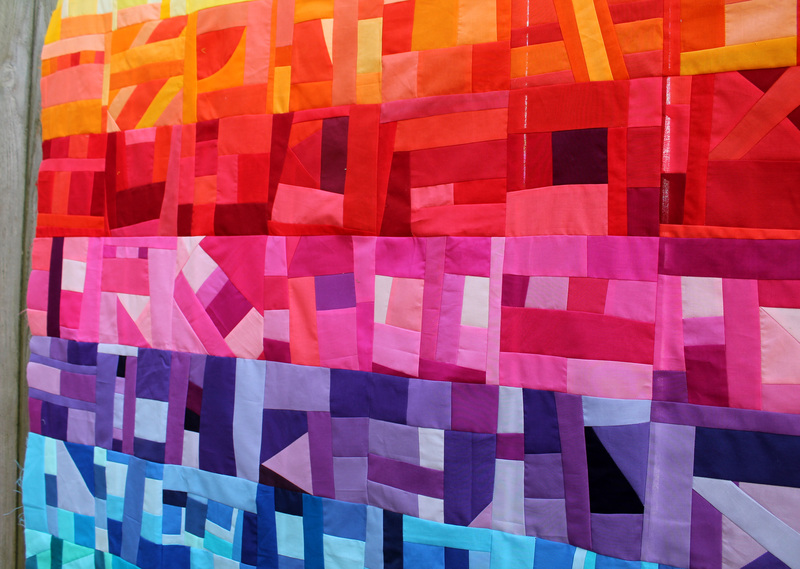 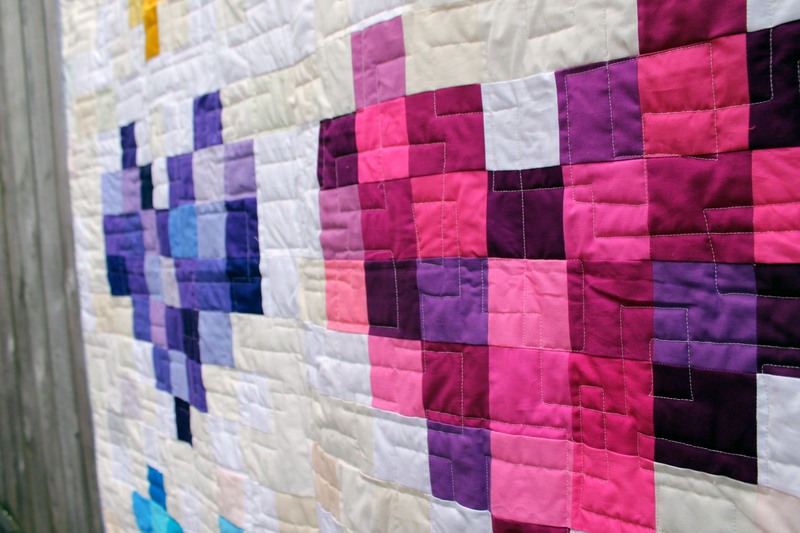 If you look closely you can see the rainbow effect of the quilting. 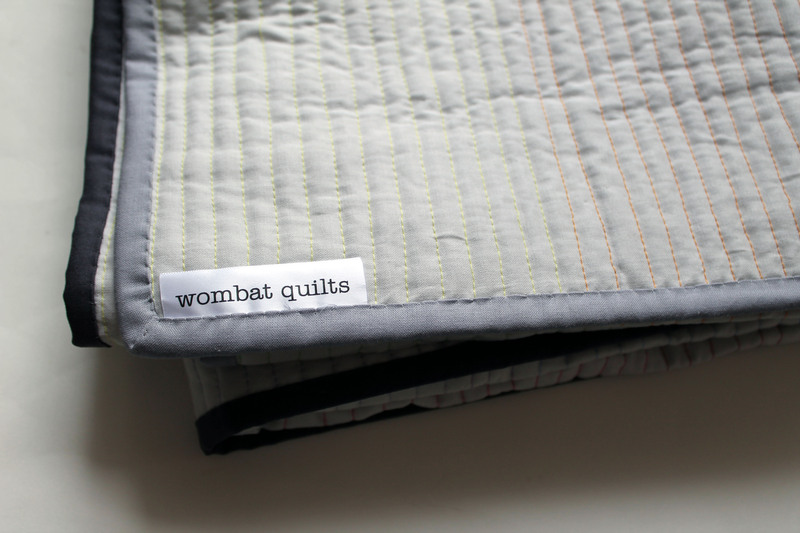 The final touch was some scrappy grey binding, a label and I was done. 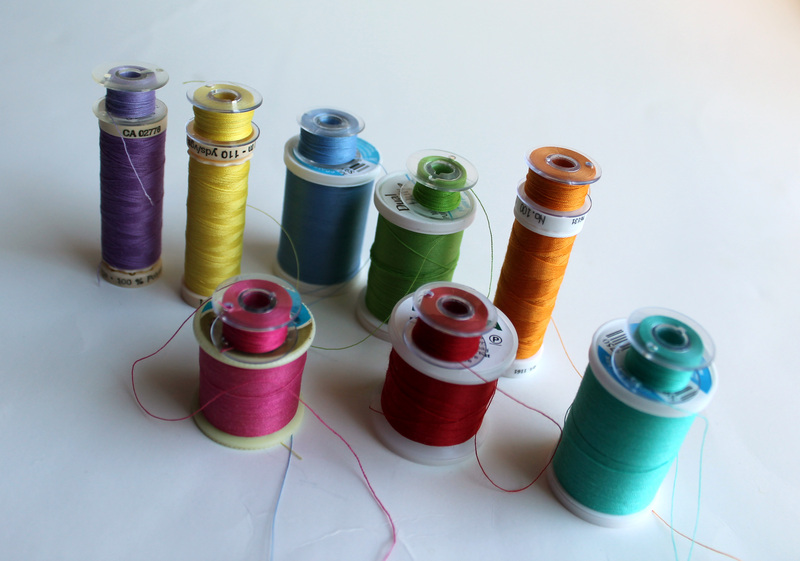 Fabric: Variety of solids – Kona, Michael Miller, American Made and Bella. 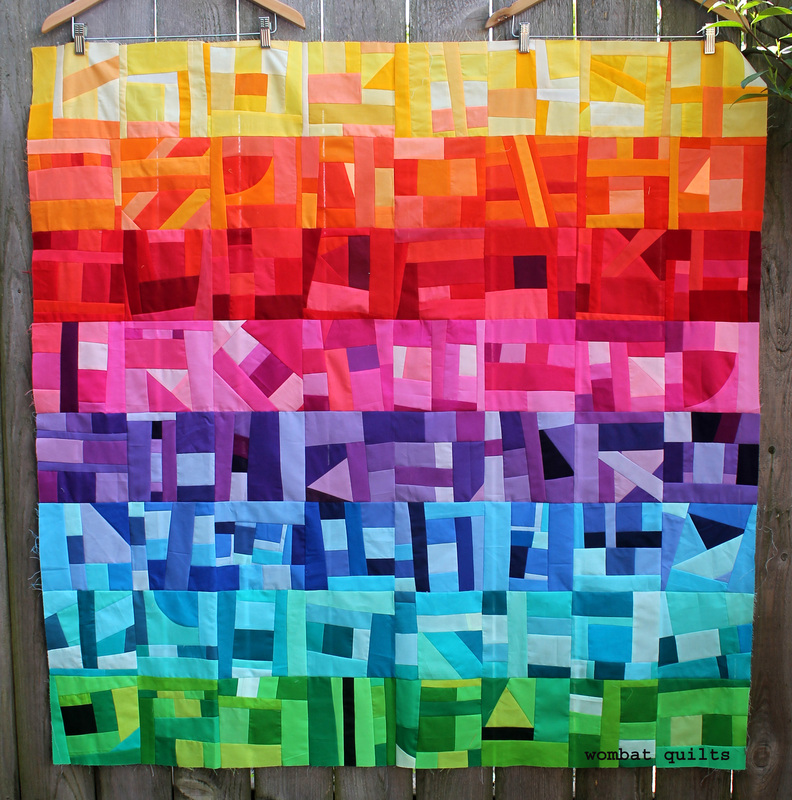 Over the last month or so I have been slowly making a quilt top, using nothing but my solid scraps. 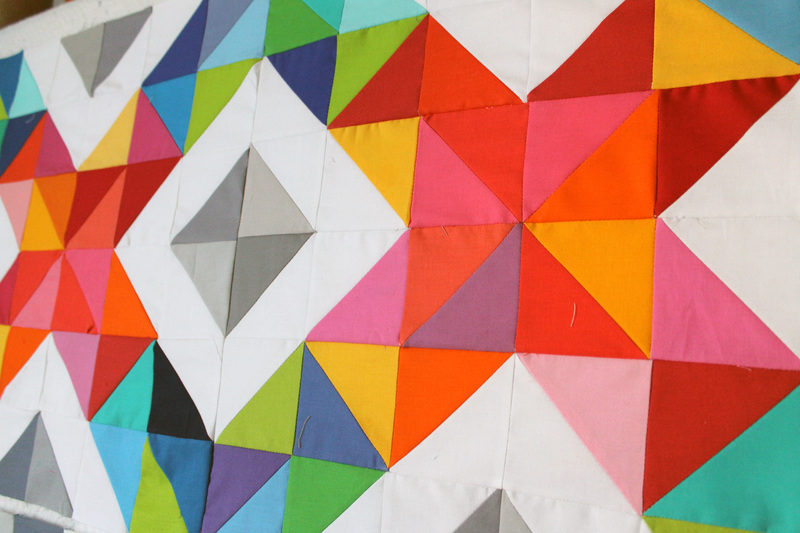 This week I finally finished sewing it all together to make this piece of modern crazy…. 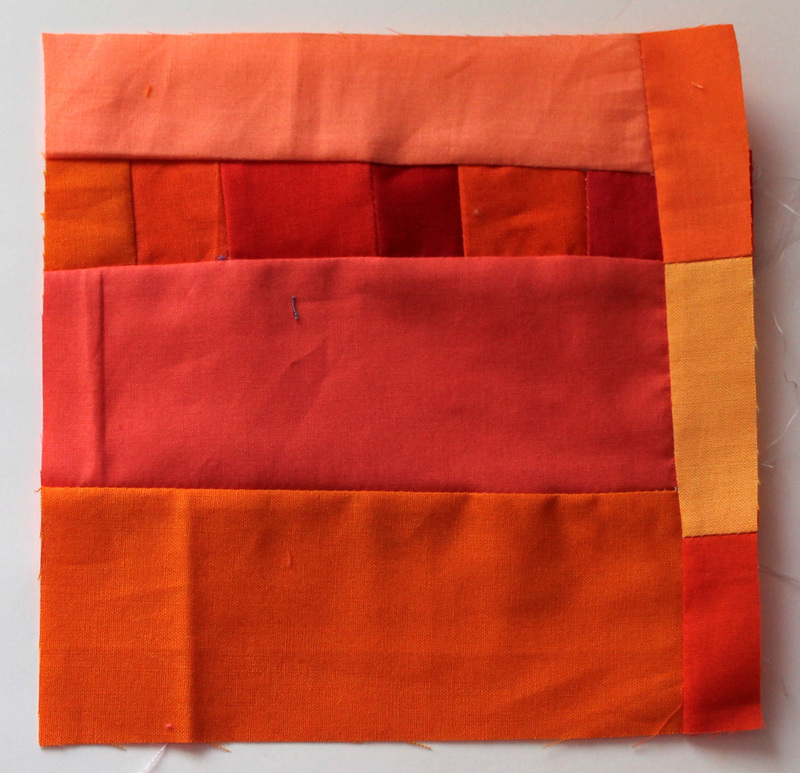 I was left with a pile of long strips, small square and random shapes. 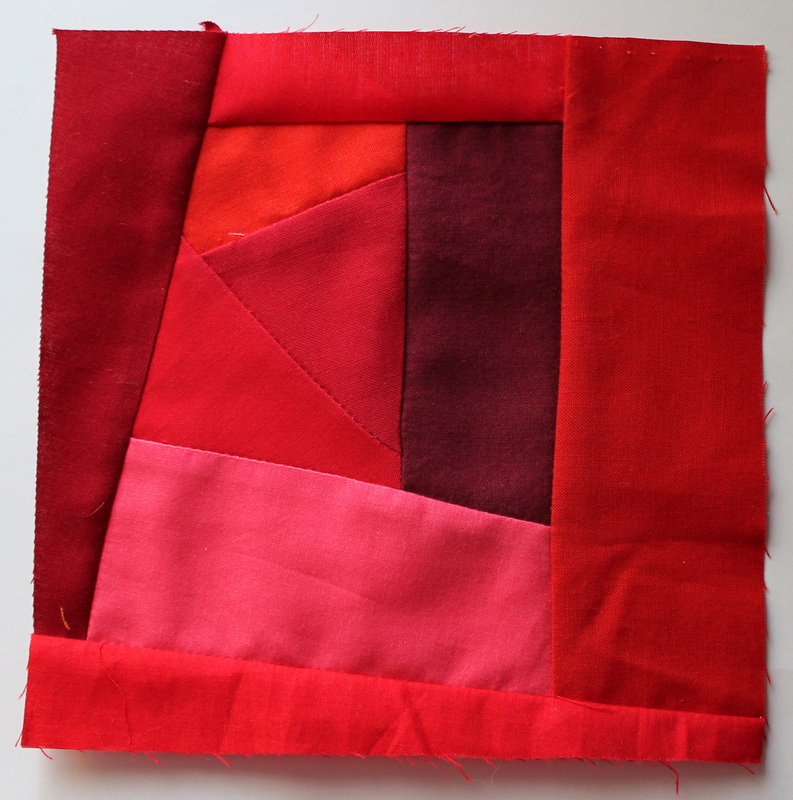 As a scrap quilter I could not just throw them away, so I started making Improv blocks. 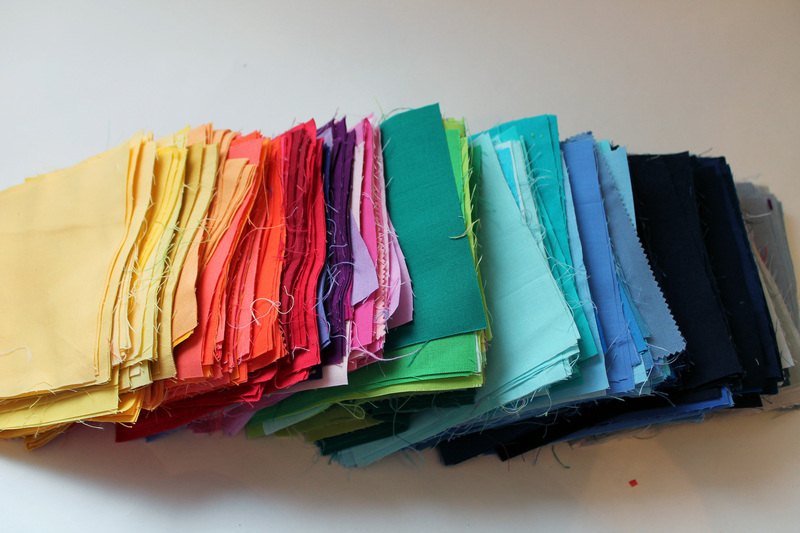 My first step was to sew lots of the small little bits together to make bigger units. 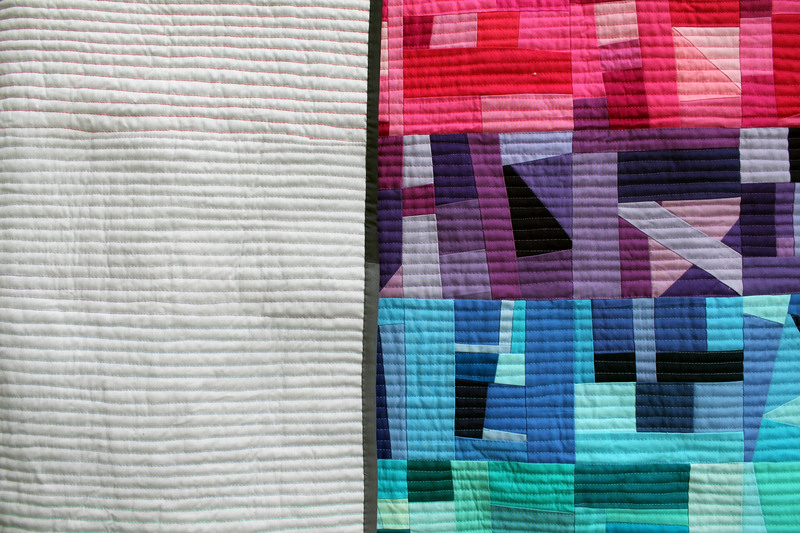 My blocks finished at 6 inches square and not one of them is even remotely like the another. 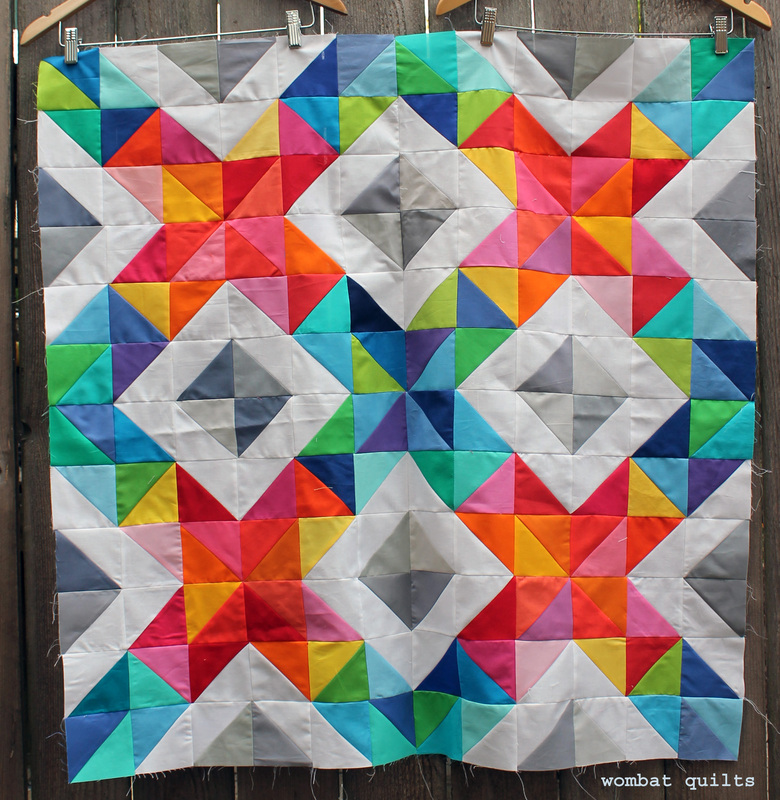 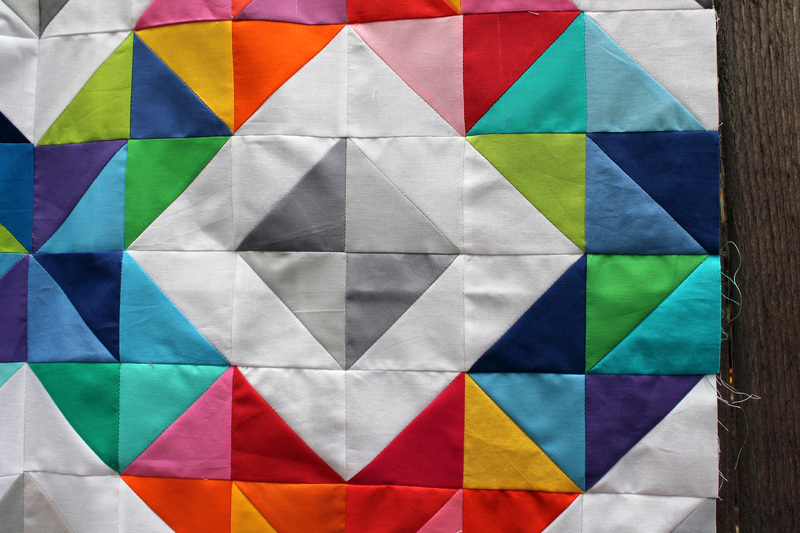 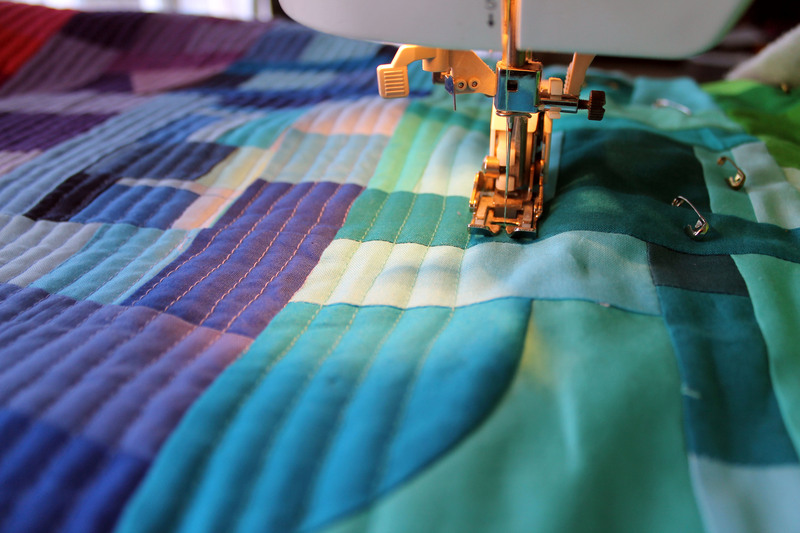 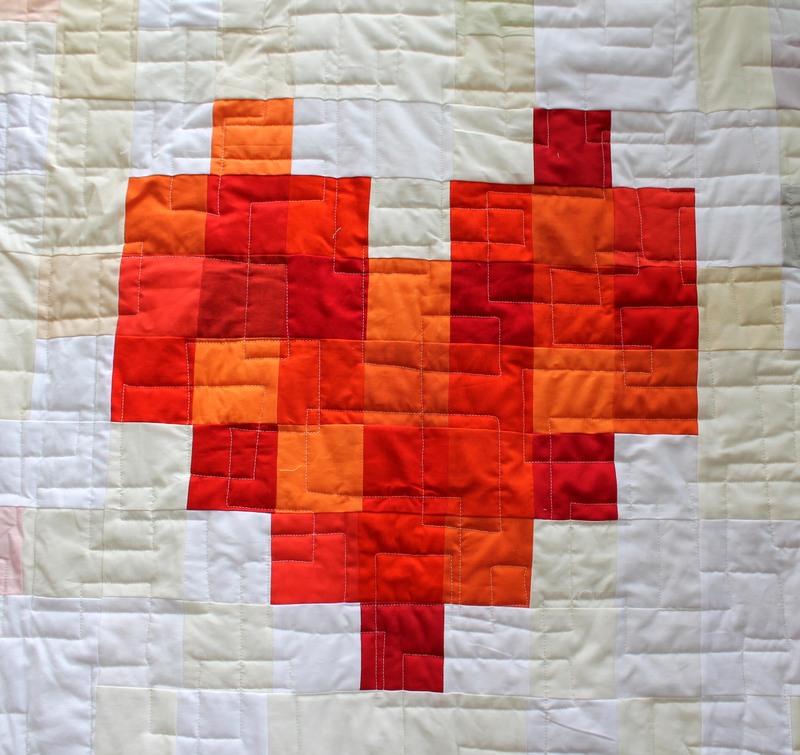 I found an amazing freedom in making this quilt….there was no pattern to follow, no measuring or pre-cutting to do. 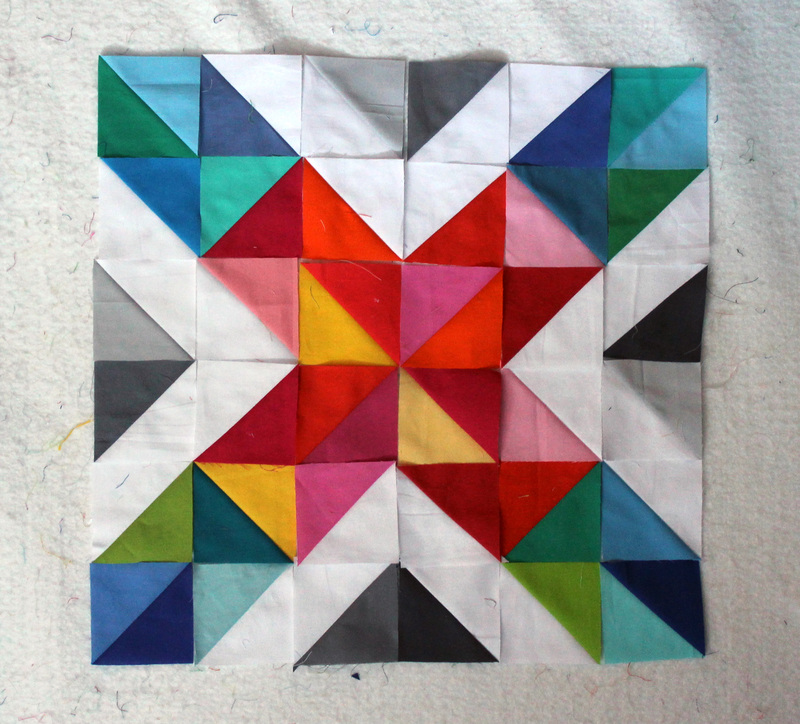 When I needed a break from paper piecing or just wanted to do something quick and creative I grabbed a handful of scraps and made some blocks. 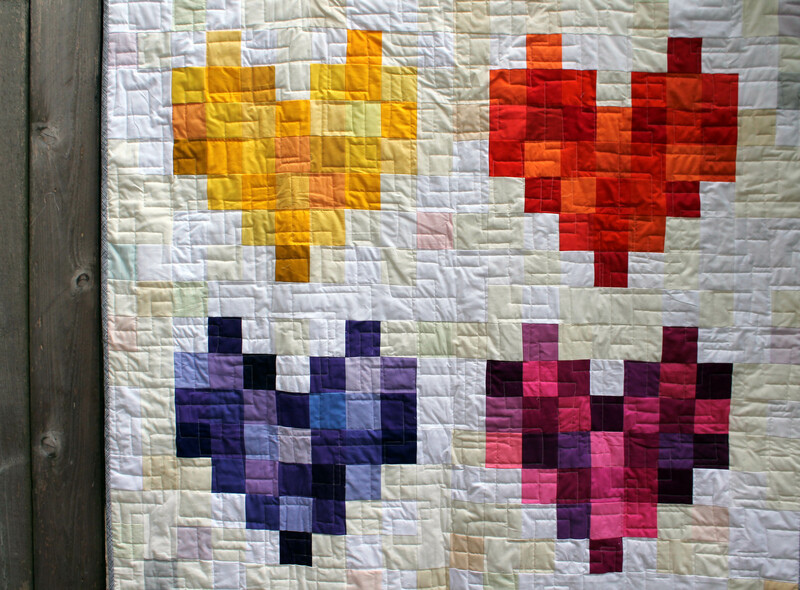 So much fun…I can highly recommend this process… it is perfect for letting go and just playing. 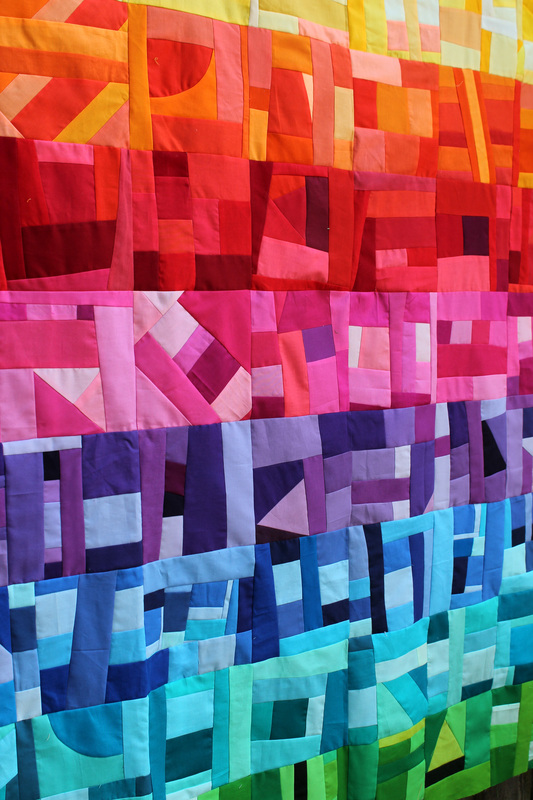 There is no right or wrong, just colour and creating and fun.